Arterial aneurysm and arterial dissection are two completely different conditions but both are commonly seen in medical malpractice litigation. Since an understanding of both conditions requires an overview of the circulatory system and the layers of the arterial wall, I thought it would be convenient to combine them together for today's topic. The arteries are the blood vessels that carry blood away from the heart to the various regions of the body, unlike the veins through which blood flows back from the body to the heart. Because the blood flowing through the arteries from the heart is under pressure created by each heartbeat, the arteries are much thicker and more muscular than the veins and are able to constrict and relax when necessary to adjust the blood pressure within the body. The layers of the wall of the arteries consist of a tough outer layer, a muscular middle layer and a thin smooth inner layer. This inner layer, the intima, plays an important role in cases of arterial dissection that we will discuss in a moment. Also, it is important to know that throughout the layers of the artery wall there is elastic connective tissue that helps the artery to resist the internal pressure and maintain its shape. First let's discuss arterial aneurysms. An aneurysm is a weakening in the wall of an artery that allows it to bulge outward like a balloon. This weakness and loss of elasticity can be caused by a variety of factors including injury, disease, congenital malformation or prolonged increases in blood pressure. 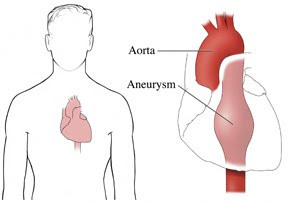 These bulging arteries can occur almost anywhere in the body but are most common in the aorta, which is the main artery that originates in the heart and courses down through the chest and abdomen, and the cerebral arteries in the head and brain. Aneurysms themselves rarely have symptoms or cause complications although large aneurysms of the cerebral arteries can cause increased pressure within the skull resulting in headaches and other neurological complaints. But aneurysms are time bombs waiting to go off. Aneurysms can rupture or burst, leading to massive hemorrhage that can result in stroke or sudden death. Litigation regarding aneurysms usually revolves around issues of diagnosis and treatment. It is important for an aneurysm to be diagnosed prior to rupture while treatment is possible. Diagnosis can be accomplished with various radiological studies including angiograms, CT scans or MRI. 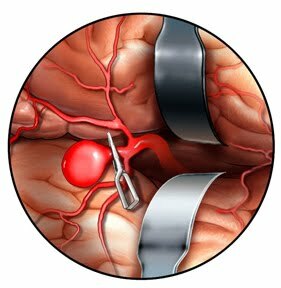 Treatment usually involves surgery either by exposing and repairing the aneurysm through an open incision or by repairing it internally via catheters advanced up through the arteries (see the animation at the top of this entry). Either way, the goal is to reinforce and strengthen the wall of the vessel and to prevent a subsequent rupture. dissection begins with a tear of the intima, inner layer, of the artery. Initially, this tear may be quite small, but over time the force of blood flow over the defect causes the torn edge to lift up and detach from the underlying layer. Over time a flap forms as the dissection continues allowing more and more of the blood to flow beneath the flap and into the space between the layers of the vessel creating a blind channel leading nowhere. Eventually the flap can become so large that normal blood flow through the vessel is blocked as the blood is channeled down beneath the intima. Also, clotting agents within the blood will recognize the tear in the intima and accumulate at the site of injury creating a clot that can also expand causing a blockage of the vessel. Either way the resulting problem with a dissection is a severe slowing or complete blockage of blood flow that deprives the tissues and organs downstream of their normal blood supply. A dissection of a carotid artery in the neck, for example, can deprive the brain of adequate blood flow resulting in a sudden stroke, permanent brain injury or even death. Arterial dissection can be caused by trauma including stretching of the vessel from acceleration and deceleration forces, by trauma caused during surgery by retractors or intravascular catheters, by injections or I.V. placements or by disease processes within the vasculature. Diagnosis is usually made when ischemia, or lack of blood flow, is recognized in the region supplied by the damaged vessel. Early diagnosis can permit surgical repair of the damaged vessel either by direct repair or surgical bypass.